There are different levels of certificates in the system. These types of certificates give opportunity to a customer to increase their possibilities in the system. The most spread is Alias certificate given automatically to a customer by the system during registration. This certificate gives opportunity to transfer money just in his/her wallet and into the system. The user of such certificate will not be able to cash out from the system. The following step of certificate is Formal. This WM-Passport will fit for active payment sysyetms users and fleerancers. use WM arbitration service in order to initiate claims and complains agains other system users. • Click on Webmoney Passport button. • Certificate will be issued in maximum in 2 working days. Getting this certificate is not free of charge and at this moment, cost consists of 10 WMZ. The next level certificate is Personal. A personal passport is the main WebMoney Transfer passport. 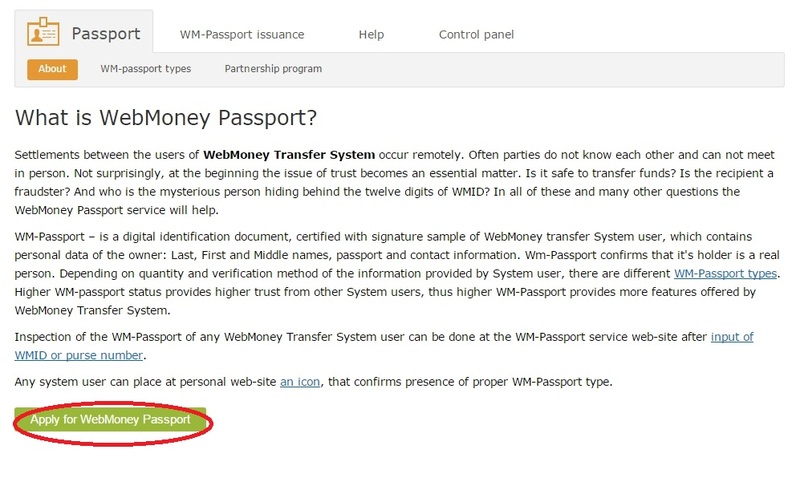 A personal passport is issued to a WebMoney Transfer member who received a formal or initial passport after their personal (passport) data have been verified by one of the Registrars that are participants in the Verification Centre Partner Program. It is impossible to get a personal passport for a second time with the same passport. • to submit complaints against other system members in the System Arbitrationwithout restrictions. Getting this certificate is not free of charge and at this moment, cost consists of 47 WMZ. • Fill in a special certificate form and confirm by your signature.